Last week I walked into a small 19th century building in the old part of a desert city to find, in its cool rooms, the work of the artist Lee Kit. His installation at the Sharjah Biennial 12 is an imprecise and warm minimalism. It is layers and drape: paint on cardboard in washes, light projected onto paintings, a dusty word on a wall, the drape of fabric, a line of string dipped in black marking the doorway so we must duck down a little to enter. I thought about the textility of veiling. There is shading over, partial cover, revelations, bright light illuminating corners, making shadows. Veiling: not subterfuge but transparency and suggestion that intensifies. Is veiling a way to think through the problem of abstraction in writing that I mentioned in my first commentary? Inside Lee Kit’s installation, I wondered: what kind of book would this be? Here I turn to Kazim Ali’s Bright Felon: Autobiography and Cities for an example of one such possibility. The veil also between what you want to see and cannot see, what you wish to have heard but did not hear. In butoh the dancers are rendered in white smoke, ghosts traversing the stage-as-womb, moving so slowly you do not even know they are there. Veil and smoke illuminate the point between seeing and not, hearing and not. Anthropologist Anjum Alvi’s recent work on the muslim veil in context and values of revealment come to mind. Revealment: as important as the notion of concealment, yet the veil is often cast, by western feminists and secular governments, as a challenge to freedom as a tool of concealment. Revealment in veiling, Alvi shows, functions to invite, sometimes to give, to provide possibilities for self, to intensify and extend the space of the self instead of diminish. The veil as a tool, a technology, a discourse. Back to Lee Kit’s black and white palette in his Sharjah installation. I thought of ink: the mark of inscription. And milky white: the texture of voice. How the juxtaposition of these two, each not always in concert with the other, may be the revelation. Does this particular framework of textility—veiling and revealment—complexify both inscription’s supposed clarity and the sure-footed, self-contained experimental gesture in conceptual writing: writing that knows what it will do ahead of its making and its maker? 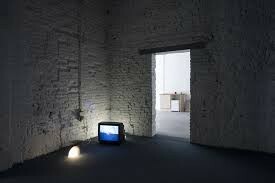 Kazim Ali’s sentence, “Constant state, sure as the white noise on the television after the station has gone off the air,” like Lee Kit’s projections of blank white light ask, “where did the image, the message go?” And so I am thinking that the illumination is not absence itself, but in the intensity of having had an experience. An afterword: this is another kind of abstraction that points back to story and not only to itself as abstraction. Clarity becomes redefined in these poetics, not to mean whole and not to mean absent, but “Always in the broken story there is more to tell.” Cardboard surfaces retain the impression of the fold, reminding us that when we look at Lee Kit’s paintings, we are being asked to see a box, broken down. It’s always the broken that holds the universe in place. That’s what I would say about poetry and prayer. And when, on the subway, reading, “you want to like very much” Gertrude Stein’s Geography and Plays “but cannot latch one thing after another so quickly when what follows does not follow,” the speaking-writing subject is “trying to tell you how ridiculously hard it was to even try to open my mouth, to make words let alone sentences. How silence can fill every space.” So the veil has many forms, including internal, swallowed, temporary, a state of being not visible. I am thinking of gauze, filters, nets and speaking-writing pushing through these filters, using the filters as objects and textures in themselves. Of Lee Kit’s semi-sheer curtains that call to mind the vocal folds that would speak the words printed on them. Speaking-writing as textility that doesn’t cover or shroud, delimit or constrict, is not quite figurative and not quite abstraction, but hangs between one world and the next, between narrator and subject, between inside and outside, between clear view and felt sense. What would a textile poetics be? Over the next three months I will document research at the crossroads—or traffic circle, really—fed by these streams: global textile practices, repetitive labor, touch as epistemology, gender, money and power, the soft and the portable, materiality, the seam, the pen and the needle and composition. I will not say that a study of textiles will help us write poems; instead, I will document how simultaneous research into text and textile infects the making and discourse of the other. Touching your sleeve at this very moment, cloth invokes lived life and social realities; “cloth helps social groups to reproduce themselves” and is a source of great “semiotic potential,” say the editors of Cloth and Human Experience. Textiles may be objects of beauty and utility and they are socially situated, as is poetry. Cloth and poetry as weave structure: a textile poetics. Jill Magi works in text, image, and textile and is the author of Threads (Futurepoem), Torchwood (Shearsman), SLOT (Ugly Duckling Presse), Cadastral Map (Shearsman), and, most recently, LABOR (Nightboat). She also just completed a monograph, available as an e-book, on textimage hybridity called Pageviews/Innervisions: a textimage theory and curriculum. Jill ran Sona Books for ten years, she was a Lower Manhattan Cultural Council writer-in-residence, and an artist in residence with the Textile Arts Center in Brooklyn. She has taught at the City College of New York, The Eugene Lang College, Goddard College, and the MFA programs at School of the Art Institute of Chicago and Columbia College Chicago. In 2013 she accepted a post in Abu Dhabi for New York University where she occasionally teaches poetry workshop, and, more regularly, a course on expository writing through the study of textiles in culture, art, and science. You can view her web-site here.